This is a free, coed, non-contact camp that is open to individuals of all abilities, male or female. 2019 marks the 14th year of the event. The annual event is held on Rocky Bleier Field on the Knights of Columbus Sports Complex, which is located directly "behind" Xavier High School at 1600 W. Prospect Ave. in Appleton, WI. 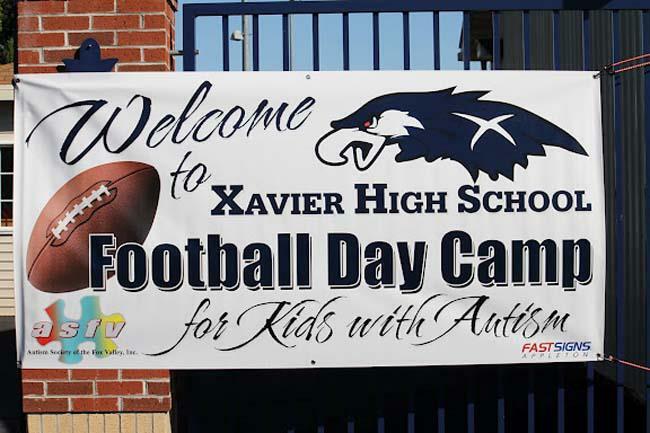 The camp is conducted by the coaches and players of the Xavier High Football program, in conjunction with the Autism Society of the Fox Valley (ASFV) plus the Xavier Booster Club. Started in 2006, the day camp has drawn participants from all over northeast Wisconsin and has grown each year to include families from all over the state -- and some have come from even Michigan and Minnesota. The event is held on a Saturday, usually in August or September. There is no cost for the camp, and you do not need to be a member of ASFV for your son or daughter to participate! A free lunch is included for everyone (campers, family members and volunteers) as part of the annual event, which traditionally starts at 10 o'clock a.m. with on-site check-in and concludes generally by about 1:00 or 1:30 p.m. Be sure to bring your camera or video camera, as there will be some great memories that you will want to record! Make plans to spend a day on the football field with Xavier Football. It's a day that will bring about a lot of smiles for your son or daughter. Located on the southwest side of Appleton, WI. About 2 miles east of Interstate Hwy 41.